NEW! 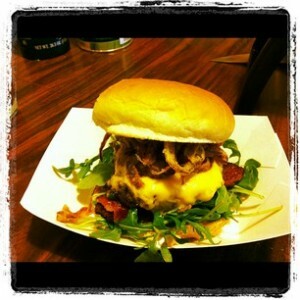 Trailer Park Truck – Los Angeles, CA (@trailerparktruk) – Food Truck Talk – Searching for the best foodtrucks! Food Truck Talk – Searching for the best foodtrucks! 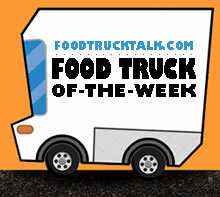 Congratulations to Trailer Park Truck as FoodTruckTalk.com’s Food Truck Of-The-Week! 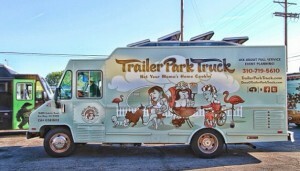 Trailer Park Truck is about great food and good times. It is the vision of Dave Miller, who spent his youth touring the world in a punk rock band, then working in the NYC music industry and party scene before finally settling in Santa Monica where he saw the need for a new kind of food truck experience. He teamed up with some of the most talented chefs in LA to develop a menu of amazing “gourmet American comfort food with a twist”. But he soon realized that it’s about more than just amazing food (you can get that on any street corner in Los Angeles) — Trailer Park Truck is a 24-hour traveling food party! 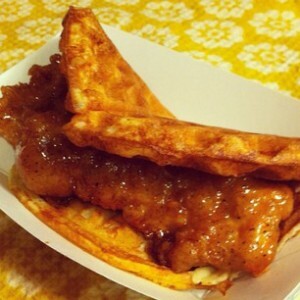 Favorite items at the Trailer Park Truck include Aunt Mimi’s Chicken & Waffles: Specially seasoned white meat chicken fried to perfection smothered in a honey maple glaze served on a crispy Belgium waffle. Also check out the Trailer Park Burger: Specially seasoned 100% Angus beef with American cheese, fried onion strings, baby arugula and housemade SECRET SAUCE! Whether you’re watching Beavis and Butthead or Dukes of Hazard while waiting to place your order or munching on the some of the best street food in LA while sitting on lawn chairs next to pink flamingos listening to 80’s hair bands, you’ll always leave Trailer Park Truck saying, “Damn, that was fun! And dang tasty too!” And that’s they we do it—for the love of great food and good fun! PreviousPrevious post:Book Report – Food Trucks: Dispatches & Recipes From The Best Kitchens On WheelsNextNext post:Gourmet Food Trucks: Where’s The Beef (Short Ribs)? Going Mobile: Haircuts, Clothing, Dumbbells & Dog Treats! FoodTruckTalk.com accompanies you around the United States in search of the newest, best and most unique food trucks and the food they serve. The food truck phenomena is sweeping America, FoodTruckTalk will keep you in touch with this rapidly changing trend. Calorie and nutrition information about all of your favorite fast foods. Restaurant health department inspection reports and information. Reviews and information about the best cupcakes, cakes and other pastry items. Where to go to find the very best pizza in your neighborhood. Directory of the best sandwich locations in the U.S.! The Best Sandwich information and discussion.